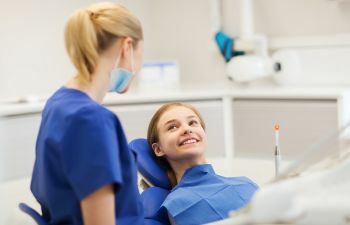 The advancements of dental technology have revolutionized many facets of dentistry, from the way we replace missing teeth to the ways in which we can detect a cavity. Tooth decay is a leading dental health problem among children as well as adults. However, most people don’t realize that cavities don’t always require a filling, especially when they are detected early. Past methods of detecting cavities included x-rays and/or dental probing (finding that sticky spot with a sharp-tip tool). The problem is that by the time decay is detected on x-ray or by manual probing, there is already significant structural damage within the tooth and a dental filling is required. Thanks to modern dental technology, things have changed and improved in terms of cavity detection. Using lasers, we can now detect an area of decay at its earliest possible stages and before the cavity has compromised the healthy tooth surface. Laser cavity detection, also known as DIAGNOdent technology, is a highly sophisticated handheld tool that allows patients to avoid costly dental restorations. DIAGNOdent cavity detection is an early-intervention method which relies on a pen-like probe that emits a laser beam to each tooth. The system then evaluates the fluorescence of each tooth and produces an audio signal and digital readout to let the dentist know the exact spot that a cavity may be forming beneath the tooth surface. Because this digitally-advanced system is so precise, it is more accurate in diagnosing a cavity compared to a dental x-ray. This superior precision also means that we can preserve more of the healthy structure of the tooth and help patients avoid drilling and other invasive repair methods. DIAGNOdent relies solely on light energy to perform diagnostics. Therefore, there is no risk of radiation exposure. DIAGNOdent is a quick and painless scanning process that doesn’t require any invasive techniques. In fact, you can remain comfortable in your dental chair without even realizing we are sending laser beams to your teeth. At Green Dental of Alexandria, we proudly invest in cutting-edge dental technology so that our patients can take advantage of more accurate and more comfortable dental care. We can perform DIAGNOdent laser cavity detection during your next dental checkup! Schedule yours today.